The Force had their championship dreams shattered by the San Diego Surge. The Surge (12-0) stunned the Force (11-1) 40-36 by scoring twice in the last 2:28 on Saturday afternoon at Heinz Field in Pittsburgh to win the WFA championship. "It was a 15-round heavyweight fight," Chicago Force head coach John Konecki said. "This was an unbelievable game," former Pittsburgh Steeler and Hall of Famer Franco Harris said after watching the contest. San Diego prevailed despite allowing 418 yards by the Force, but the Surge received an outstanding effort from running back Cassey Brick. Brick scored four touchdowns and had 211 all-purpose yards in the win. Chicago has relied on the 1-2 punch of quarterback Sami Grisafe and running back Melissa Smith, who scored 33 touchdowns this past season. Both players performed extremely well in this historic game. This event represented the first women's championship played in an NFL stadium. The game was broadcast live on ESPN3. Grisafe was named the Force Championship MVP for completing 21-of-32 passes for 269 yards. Smith rushed for 111 yards and was the workhorse of the offense as she pounded out first downs and kept the chains moving. Chicago dominated in every statistical category except the scoreboard. "When you remove their 4 scoring plays from scrimmage, they only gained 70 yards on 47 offensive plays," said team owner Linda Bache. The Force defense was led by Darcy Leslie, Kim Marks, Dorian Bridges and Emma Finestone. "I'm proud of my team for a lot of things," Grisafe stated after the heartbreaking loss. "Unfortunately, time ran out on us. We didn't come out on top and things happen. I'm the quarterback and it's hard for me not to get the win." "Chicago's a helluva team," San Diego head coach Mike Suggett said in the postgame news conference. "Coach Konecki has had the Force rolling for many years. We knew it was going to be a dogfight." Chicago rallied from a 20-6 deficit in the opening quarter to take a 36-27 lead. Grisafe led the comeback with four touchdown passes as San Diego's defense kept Smith out of the end zone. Grisafe threw her fourth touchdown pass of the game to Albi Zhubi. Zhubi made a great catch to give the Force a 36-27 lead with 3:19 left. Then, Brick stole the show with two touchdowns. Brick caught a 64-yard touchdown pass with 2:28 to cut the lead to 36-34. 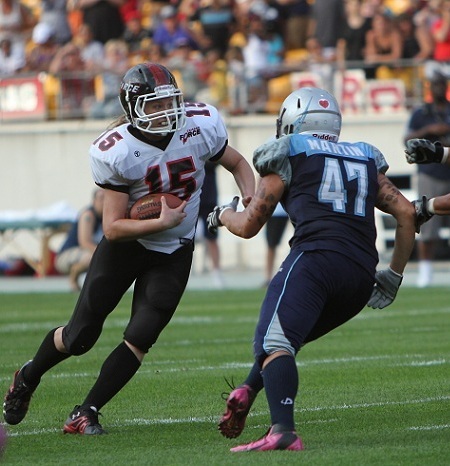 After the Force failed to score on the next series, Brick returned a punt 66 yards for the game-winning touchdown. "Special teams can really win or lose a game," the Hall of Famer Harris said. San Diego started the game with a 82-yard kick return touchdown. Chicago had one last chance with 1:43 left in the game, starting from their own 5 yard line. Grisafe brought the screaming crowd to their feet as she completed three straight passes for 80 yards, giving the Force possession at the San Diego 15-yard line. On the next play the Surge ended Chicago's dreams with an interception in the waning seconds. San Diego then took a knee to run out the clock and seal the victory. "It hurts to lose," Konecki admitted. "I'm not upset with my team. They gave us everything."